This name uses Spanish naming customs: the first or paternal family name is Chaves and the second or maternal family name is Rubio. Johan Esteban Chaves Rubio (born 17 January 1990) is a Colombian professional road bicycle racer who rides for UCI ProTeam Orica–BikeExchange. Born in Bogotá, Chaves has competed as a professional since the start of the 2012 season, having signed for the Colombia–Coldeportes team as a neo-pro, after three seasons as an amateur with the Colombia es Pasión–Coldeportes team. As an amateur, Chaves was the winner of the French Tour de l'Avenir race in 2011, a race previously won by five future winners of the Tour de France. 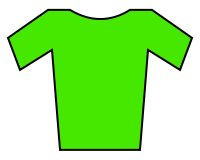 Chaves had been part of the breakaway on the first road stage of the race, taking the mountains jersey after the stage. He surrendered that lead to Garikoitz Bravo the next day, but reclaimed the lead on the third stage, having led the field over the Grand Ballon. Bravo took the lead again after the fourth stage until the end of the race, but Chaves moved into contention for the overall honours with several top-ten stage finishes, and trailed race leader David Boily by seven seconds before the final stage, in Alba, Italy. Chaves was part of a four-rider breakaway that moved clear of the field after the penultimate climb, and although he was beaten to the line by Warren Barguil and Mattia Cattaneo, Chaves' third place coupled with a 24-second time gap to the field, allowed him to win the race by 17 seconds. Chaves turned professional with the newly formed Colombia–Coldeportes team for the 2012 season, as his former team Colombia es Pasión–Café de Colombia returned to the domestic ranks in Colombia. He competed in several of the early-season Italian races, including Tirreno–Adriatico, but withdrew from the race on the penultimate day. After finishing 18th in his home race, the Vuelta a Colombia, Chaves returned to Europe for the Prueba Villafranca de Ordizia single-day race in the Basque Country. Chaves made an attack with 10 km (6.2 mi) remaining but Euskaltel–Euskadi's Gorka Izagirre shadowed his move, with Izagirre eventually beating Chaves in the sprint finish. Chaves continued his form into the Vuelta a Burgos, where he won the final stage of the race. Team Sky team-mates Rigoberto Urán and Sergio Henao animated the field on the final climb to Lagunas de Neila, and only Chaves was able to follow the pair; Chaves ultimately beat his former team-mate to take his first professional victory on the line, and allowed him to finish the race in third place overall. The following weekend, Chaves took victory in the Gran Premio Città di Camaiore in Italy, from a five-rider group, after forming the group with Italian national champion Franco Pellizotti of the Androni Giocattoli–Venezuela team, on the Monte Pitoro climb. Chaves suffered severe injuries in a crash at the Trofeo Laigueglia in February 2013. The team doctor revealed that he had a compound fracture to his right collarbone, fractures in his left petrous bone, right cheekbone, maxillary sinuses and sphenoid bone, and also received pulmonary compressions, abrasions and suspected rib fractures. Chaves moved to the Orica–GreenEDGE team for the 2014 season, on a two-year contract. At the 2015 Vuelta a España, Chaves won the Stage 2 by outsprinting Tom Dumoulin(Team Giant–Alpecin) and Nicolas Roche (Team Sky) at the summit of the final third category climb of Caminito del Rey. By doing so he took the overall race lead. Chaves lost the race lead on Stage 5, as he was caught out in a split in the peloton at the finish and dropped 6 seconds to Dumoulin. However, on Stage 6 Chaves attacked 2 km from the summit of the final climb to Sierra de Cazorla and held off Dan Martin (Cannondale-Garmin) and Dumoulin by five seconds to his second stage win and retake the race lead. During the Vuelta Chaves extended his contract for a further three years. He eventually finished the Vuelta in fifth place overall. 2016 was a strong season for him as he finished second in the Giro, third in the Vuelta, and won the Giro di Lombardia. ↑ ""Chavito" getting to like it!". Colombia–Coldeportes. Libero. 11 August 2012. Retrieved 11 August 2012. ↑ "Colombia-Coldeportes (COL) – COL". UCI Continental Circuits. Union Cycliste Internationale. Retrieved 11 August 2012. 1 2 "Orica GreenEdge sign Esteban Chaves". Cyclingnews.com. Future plc. 18 October 2013. Retrieved 16 December 2013. ↑ Stokes, Shane (6 December 2011). "Complete Colombia-Coldeportes 2012 roster finalized, team to push for big invites". VeloNation. VeloNation LLC. Retrieved 11 August 2012. 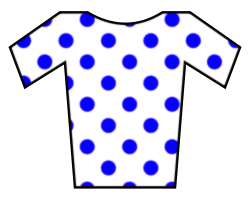 ↑ "Hofland wins from break in Lunéville". Cycling News. Future Publishing Limited. 5 September 2011. Retrieved 11 August 2012. ↑ "Hepburn takes second stage at Tour de l'Avenir". Cycling News. Future Publishing Limited. 7 September 2011. Retrieved 11 August 2012. ↑ "Colombia defends Tour de l'Avenir title". Cycling News. Future Publishing Limited. 12 September 2011. Retrieved 11 August 2012. ↑ Stokes, Shane (12 September 2011). "Chaves seals Tour de l'Avenir win for Colombia". VeloNation. VeloNation LLC. Retrieved 11 August 2012. ↑ "Colombia-Coldeportes 2012 roster completed". Colombia–Coldeportes. Libero. 9 January 2012. Retrieved 11 August 2012. ↑ "Izagirre triumphs in Spain". Yahoo! Eurosport. TF1 Group. 25 July 2012. Retrieved 11 August 2012. ↑ "Outstanding Chaves' premiere at Vuelta a Burgos". Colombia–Coldeportes. Libero. 5 August 2012. Retrieved 11 August 2012. ↑ "Camaiore, festa Chaves; Bravo Pellizotti: è terzo" [Camaiore, a party for Chaves; Bravo Pellizotti: third]. La Gazzetta dello Sport (in Italian). RCS MediaGroup. 11 August 2012. Retrieved 11 August 2012. ↑ Moore, Kyle (18 February 2013). "Colombia's Johan Esteban Chaves recovering after Trofeo Laigueglia crash". VeloNation. VeloNation LLC. Retrieved 18 February 2013. ↑ Windsor, Richard (8 September 2015). "Esteban Chaves earns extended contract with Orica-GreenEdge after Grand Tour breakthrough". Cycling Weekly. Time Inc. (UK) Ltd. Retrieved 8 September 2015. 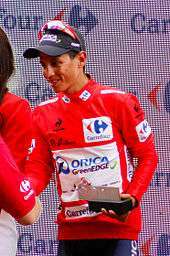 Wikimedia Commons has media related to Esteban Chaves.